Goodspeed Notes is the online newsletter of the Department of Music. 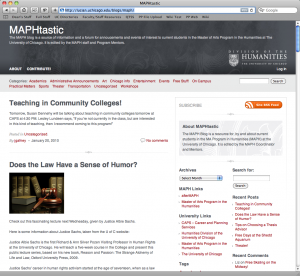 The MAPH blog is a source of information and a forum for annoucements and events of interest to current students in the Master of Arts Program in the Humanities at the University of Chicago. It is edited by the MAPH staff and Program Mentors. The MAPH newsletter runs on the Carrington WordPress theme and takes its design cues from the Humanities News site. A sister version of the site (AfterMAPH) is directed primarily at MAPH alumni. I’ve listed it here since it is one of the few WordPress sites hosted by the division that are structured by and large exactly like a traditional blog. If you’re interested in other words in creating a newsletter for your department or group you may want to instead think about structuring it along the lines of a blog instead of trying to emulate the look and feel of a printed publication. Please note also the extensive use of category based menus (categories are subject tags associated with individual posts). This is a quick and easy way to add extra navigation and search (browse) options to a site.